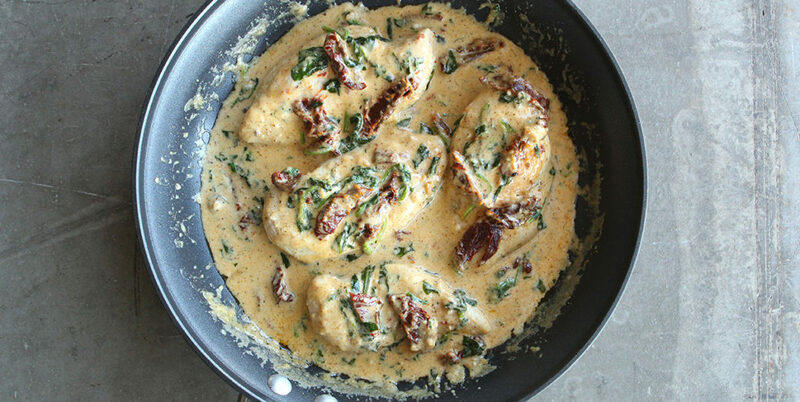 Creamy Tuscan Garlic Chicken has the most delicious creamy garlic sauce with spinach and sun dried tomatoes. This meal tastes like it’s straight from your favorite restaurant, and it only takes 30 minutes to make! You definitely need to put this meal at the top of your list this week! It was honestly one of the best things I have ever made. For variety, you could serve it over pasta or rice. In a large skillet add olive oil and cook the chicken on medium high heat for 3-5 minutes on each side or until brown on each side and cooked until no longer pink in center. Add the spinach and sundried tomatoes and let it simmer until the spinach starts to wilt. Add the chicken back to the pan and serve over pasta if desired.